The Deep Super provides adequate space for large brood areas. This is the most convenient size for honey supers. 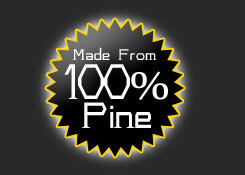 Order different sizes of beehives made from 100% pine wood.  Over the years a wide variety of beehives have been developed for cultivating honey bees. 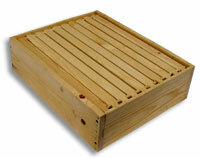 Tom's Bee Hives use the Langstroth or modern ten-frame hive. Our beehives consists of a bottom board with an adjustable seasonal entrance, a series of Shallow Supers or Deep Supers with suspended frames containing foundation or comb, and inner and outer covers. The outer cover protects hive parts from the weather. It fits over the inner cover and the top edge of the uppermost hive body. Removal of the outer cover, with the inner cover in place, disturbs few bees within the hive and allows the beekeeper to more easily smoke the bees. 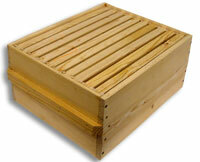 Beekeepers that routinely move beehives use our simple cover, also called a migratory lid. Our covers fit flush with the sides of the hive body. In addition to being lightweight and easy to remove, these covers allow colonies to be stacked. The inner cover rests on top of the uppermost super and beneath the outer cover. It prevents the bees from gluing down the outer cover to the super with propolis and wax. It also provides an air space just under the outer cover for insulation. During summer, the inner cover protects the interior of the hive from the direct rays of the sun. During winter, it prevents moisture-laden air from directly contacting cold surfaces. These frames fit the Shallow Super. Each frame consists of a top bar, two end bars, and a bottom bar. The Shallow Super is known by many names - it is sometimes called the Dadant Super, Illinois Super, Western Super, or Honey Super. No matter what it's is known by, these frames are where the honey bees store surplus honey for harvesting. If the Shallow Super frames are not the exact fit for hives you already own, give us a call, we are happy to custom build frames to fit the size and style of hive you have. The Shallow Super is 5 3/4 inches high. This is the most convenient size for honey supers. The Shallow Super will hold approximately 40 pounds of honey when all the honeycomb is drawn out and filled. For people who don't like lifting and carrying the heavier Deep Super, this is a good compromise. The suspended beeswax comb held within a frame is the basic structural component inside the hive. Each frame consists of a top bar, two end bars, and a bottom bar. Frames with new foundation should only be given to rapidly growing colonies such as a package, swarm, or colony split (division) or to established colonies during a major nectar flow. Workers build beeswax combs of six-sided cells by adding wax to the cell base imprints on the sheet of foundation. When foundation is given to colonies during a nectar dearth, the bees will often chew holes in the foundation, thus resulting in poorly drawn finished combs. Beeswax is produced by four pairs of glands on the underside of the workers abdomen. As wax is secreted and exposed to the air, it hardens into flat wax scales. To produce comb, the bees remove the wax scales from the underside of the abdomen with spines located on their middle legs. The wax scale is then passed to the mouthparts where it is manipulated until pliable and ready to be formed into six-sided cells. 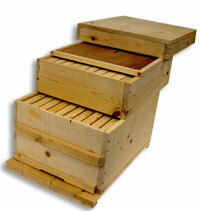 The full-depth Deep Super hive body, 9 5/8 inches high, is most often used for brood rearing. 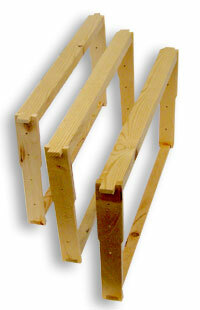 These large units provide adequate space with minimum interruption for large solid brood areas. They also are suitable for honey supers. However, when filled with honey, they weigh over 60 pounds and are heavy to handle. Normally a single full-depth brood chamber is used when beekeepers want to crowd bees for comb honey production, when a package is installed, or when a nucleus colony or division is first established. 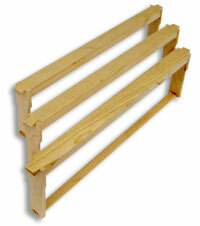 The adjustable seasonal entrance provides either a 7/8" or 3/8" inch opening in front depending on the season. Use the larger entrance in the summer, and the smaller entrance in the winter. To adjust the seasonal entrance all you have to do is slide out the board and flip it over. The bottom board serves as the floor of the colony and as a takeoff and landing platform for foraging bees. Since the bottom board is open in the front, the colony should be tilted forward slightly to prevent rainwater from running into the hive. Our bottom boards are reversible, with an adjustable seasonal entrance so you can control the size of the opening for the bees.